An enterprise is said to have a center of economic interest and to be a resident unit of a country (economic territory) when the enterprise is engaged in a significant amount of production of goods and/or services there or when it owns land or buildings located there. The enterprise must maintain at least one production establishment in the country and must plan to operate the establishment indefinitely or over a long period of time. vi) Investment Allowance (utilized) Reserve. Direct investment is a category of international investment in which a resident entity in one economy (direct investor (DI) acquires a lasting interest in an enterprise resident in another economy (Direct Investment Enterprise (DIE). It consists of two components, viz., Equity capital and Other Capital. It covers (1) Equity in branches and all shares (except non-participating preferred shares) in subsidiaries and associates; (2) Contributions such as the provision of machinery, land & building(s) by a direct investor to a DIE by equity participation; (3) Acquisition by a DIE of shares in its direct investor, termed as Reserve investment (i.e. claims on DI). If the Indian company has issued the shares to non-resident entities under the FDI scheme in India, then it should be reported under the Foreign Direct Investment in India (Liabilities), Section II of the return. If the non-resident entity holds the 10 per cent or more equity/ ordinary shares in the reporting Indian company, then it should reported under Block 3A (item 1.2, liabilities to direct investment). However, if the non-resident entity holds less than 10 per cent of the equity capital of reporting Indian company, then it should be reported under Block 3B (item 1.2, liabilities to direct investment). In both the cases, the investing non-resident entity is called as the Direct Investor (DI) while the reporting Indian company is called as Direct Investment Enterprise (DIE). 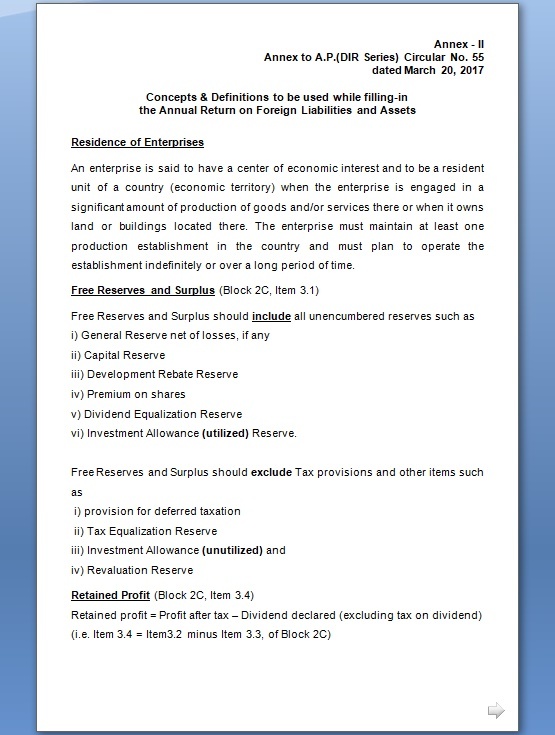 If the reporting Indian company also holds the equity shares in its DI company abroad and if its share is less than 10 per cent of equity capital of DI company, then it is called as reverse investment and same should be reported under item 1.1 (claim on direct investor) of the respective block i.e. Block 3A or 3B. If the reporting Indian company invest in equity shares of non-resident company, under the Overseas Direct Investment scheme in India, i.e. investment in Joint venture or Wholly owned subsidiaries abroad, then it should be reported under the Foreign Direct Investment abroad, Section III. If the equity holding of Indian company in non-resident company is 10 per cent or more, then it should be reported under Block 5A (item 1.1 claim on DIE), otherwise, it should be reported under Block 5B (item 1.1, claim on DIE). In both the cases, Indian company is called as the Direct Investor (DI) while the non-resident company is called as Direct Investment Enterprise (DIE). If the non-resident DIE also holds the equity shares in Indian reporting company (DI) and if its share is less than 10 per cent of equity capital of reporting company, then it is called as reverse investment and same should be reported under item 1.2 (liabilities to DIE) of the respective block i.e. Block 5A or 5B. The other capital (inter-company debt transactions) component of direct investment covers the outstanding liabilities or claims arising due borrowing and lending of funds, investment in debt securities including non-participating preference shares, trade credits, financial leasing, share application money, between direct investors and DIEs and between two DIEs that share the same Direct Investor. Non-participating preferred shares owned by the direct investor are treated as debt securities & should be included in Other Capital. It covers external claims by or liabilities to reporting Indian company in equity and debt securities other than those included in direct investment (Block 3A, 3B and 5A, 5B). Debt securities include long-term bonds and notes, short-term money market instruments. Any investment is made by the non-resident entities in Indian company under the Portfolio Scheme in India should be should be reported under Block 3A (Portfolio liabilities). Any investment made by the Indian company in foreign shares and / or debt securities, apart from the investment made under the Overseas Direct Investment Scheme, should be reported under Block 5A (Portfolio assets). Equity securities are instruments acknowledging the holders' claim to the residual income of the issuing enterprise after the claims of all creditors have been met. These include ordinary shares, stocks, participating preference shares, depository receipts (ADRs/GDRs) denoting ownership of equity securities issued to non-residents, shares/units in mutual funds & investment trusts, equity securities that are sold under repurchase agreement, equity securities that are sold under securities lending arrangement. These include bonds and notes, money market instruments. This category includes debt securities with original contractual maturities of more than one year (long-term). It includes the long-term securities such as Debentures, Non-participating preference shares, Convertible bonds, Negotiable certificates of deposit, Perpetual bonds, Collateralized mortgage obligations, Dual currency, Zero coupon and other Deep discounted bonds, Floating rate bonds and Index-linked bonds. These short-term instruments include treasury bills, commercial paper, banker’s acceptances, short-term negotiable certificates of deposit and short-term notes issued under note issuance facilities. It may be noted that the instruments that share the characteristics of money market instruments but are issued with maturities of more than one year are classified as Bonds and Notes. Financial derivatives are linked to a specific financial instrument, indicator, or commodity and through which specific financial risks can be traded in the financial markets in their own right. Derivative instruments include futures, interest and cross-currency swaps, forward rate agreements, forward foreign exchange contracts, credit derivatives and various types of options. Trade credits are assets and liabilities that arise from the direct extension of credit from a supplier to a buyer for transactions in goods and services and advance payments by buyers for transactions in goods and services and for work in progress. Trade credit assets are advance payments made by importer (you) for (your) imports or credit extended by exporter (you) directly to (your) importer. Trade credit liabilities are advance payment received by the exporter (you) for (your) exports or credit received by importer (you) directly from (your) exporter. It may be noted here that funding provided by an enterprise other than the supplier for the purpose of purchasing goods or services is treated as a loan and not as trade credit. Loans are direct lending of funds by a creditor to a debtor through arrangements. These include, loans to finance trade (i.e. Buyers’ credit in which a bank or a financial institution or an export credit agency in the exporting country extends a loan directly to a foreign buyer or to a bank in the importing country to pay for the purchase of goods and services), mortgages, and other loans and advances. Financial leases and repurchase agreements are also considered loans. Note that loan received from the non-resident direct investor should be reported under Other Capital of Block 3A or 3B while loan extended to your subsidiaries/ associates abroad should be reported under Other Capital of block 5A or 5B. These outstanding loans should be reported under the loan item of Block 3C or 5C. These are the residual items that include all external financial liabilities and assets not recorded elsewhere in the liabilities/assets. These are miscellaneous accounts receivable and payable such as accounts relating to interest payments in arrears, loan payments in arrears, wages and salaries outstanding, prepayments of insurance premiums, taxes outstanding & the like. Long-term investment is defined as investment with an original contractual maturity of more than one year. Short-term investment includes currency, investment payable on demand or with an original contractual maturity of one year or less. Any disinvestments made by non-resident direct investor of the reporting Indian company during the year should be reported in Block 3A and Block 3B and portfolio disinvestments in Block 3A. Likewise, any disinvestment made by the reporting Indian company in its DIE abroad during the year should be reported in Block 5A and 5B and portfolio disinvestments by reporting company should be reported in Block 5A. Contingent liabilities are obligations that arise from a particular discrete event(s), which may or may not occur. Contingent liabilities are (i) explicit - arise from a legal or contractual arrangement (Loan & other payment guarantees, credit guarantees, Contingent credit availability guarantees, exchange rate guarantees, etc) and (ii) implicit - do not arise from a legal or contractual source, but recognized after a condition or event is realized. If the Indian company has extended a guarantee to a loan taken by non-resident entity (may be its subsidiary abroad), such guarantees are part of contingent foreign liabilities. In this case, under column1 of block 7, “Loan Guarantee” needs to be mentioned. Country should relate to the country of location of the non-resident creditor involved in the transaction. To illustrate, as mentioned above, if the contingent foreign liability is in connection with guarantees on loans, the country of location of the non-resident creditor to whom such guarantees are given, needs to be reported in column 2.